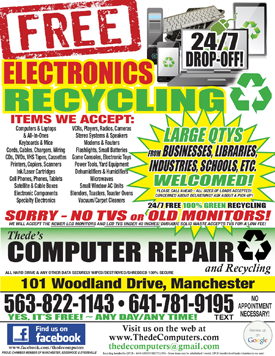 Welcome to Thede's Computer Repair & Recycling! Businesses, Schools, Industries etc - QUESTIONS? data recovery & advanced data recovery services available! reliable and dependable with LOW RATES and EXCELLENT SERVICE! FAMILY-Owned - COMMUNITY-Oriented - LOCALLY Available for YOU! Please contact us today to find out what we can do FOR YOU! Recycling is 24/7 - outside drop-off pallet and bins are available! THANK YOU FOR RECYCLING & KEEPING IOWA GREEN! on East Main Street just before the 3-way stop! just past the 3-way stop! You'll see our signs! ITEMS WE ACCEPT! - PRINTABLE FLYER CLICK HERE! View a more detailed list here! IN ANY WAY - WE'LL TAKE IT! YOUR COMPUTER/LAPTOP DATA IS 100% SECURE! DESTROYED BEFORE GOING TO METAL SHREDDING! If you have more than a truckload to drop off for recycling, please contact us and we will schedule a convenient time for your drop-off! Thank you! 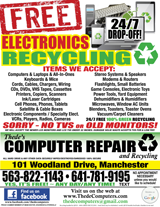 need professional electronics recycling services? for your community / business! We are also a proud NFIB member! in the Tama/Toledo area and in 2004 in Elkader, locating back to Manchester in 2005. 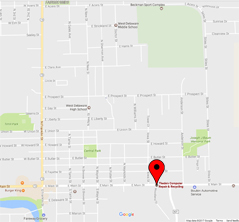 SEVERAL local, business and area references available! 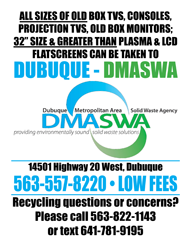 Iowa, Illinois & Wisconsin to licensed recycling facilities! Some items may be refurbished & resold - QPCR benefits food banks / charities in our area!